#MyCoopStory 2017: Tell us about your collaborative #coop project and win a trip to Paris! Are you a young person aged 18-35 developing a cooperative project or setting up a cooperative business with a collaborative economy dimension? If yes, we want to hear from YOU! The award ceremony took place on the 14th & 15th of September at Coop FR's 70th anniversary celebrations of the French cooperative law. The event celebrated the progress achieved and looked to the future of the cooperative movement to further promote and reflect the strenghts of achieving a more cooperative society, which is not possible without the involvment of youth. Lauding their contirbution to shaping a cooperative collaborative economy, the #MyCoopStory prizes were awarded by President Jean-Louis Bancel (Cooperatives Europe), Director Agnes Mathis (Cooperatives Europe), Secretary-General Caroline Naett (Coop FR) and President Sebasten Chaillou (Young European Cooperators Network). Ridygo is an innovative ridesharing platform cooperative that makes everyday rides not only flexible, but inclusive. How? By bringing the cooperative model to the heart of collaborative economy not only through the governance framework, but by addressing solidarity and social inclusion concerns around mobility. Half of the 20% fee taken by Ridygo is converted into riding credits for the unemployed. Watch his winning video here. Can we have a Bank in which all members will have the equal right to vote? The Bank we own? Ivan and his project Cooperative for Ethical Financing believe yes. Our runner-up of #MyCoopStory is developing a bank that will be guided by cooperative principles, financing production instead of fuelling consumption, investing in projects generating real value instead of speculating on financial markets, redirecting profit to local community projects instead of small number of shareholders.Watch his video here. Boschi Vivi is an innovative Italian cooperative that provides a natural burial of ashes in forests. By becoming an owner of a tree you will continue to contribute to the sustainability of the forest and the landscape even after death. Watch Anselma's video here. Thank you to all young cooperators for sharing your stories with us and follow Cooperatives Europe on Facebook and Twitter to find out more about the winners and other contestants in the coming weeks. All the photos from the winning ceremony are available here. The audio files of the youth's acceptance speeches can be found here. The collaborative economy is the inherently young and hot topic of the year and continues to present numerous opportunities for today’s cooperatives to contribute to its innovation. New cooperative start-ups active in the collaborative economy are steadily growing, bringing democratic governance, human centred and value based economy to the sector. We want to showcase the best examples of what Europe’s young cooperators have to offer in this field (after all, it’s a priority of CoopsEurope in 2017). We teamed up with CoopFR – the representative organisation of the French cooperative movement who are celebrating the 70th anniversary of the French Cooperative Law, and the Young European Cooperators Network (YECN) – a network of coop youth from 15 countries. #MyCoopStory will see young cooperators present their businesses and explain their projects or activities in the collaborative economy. 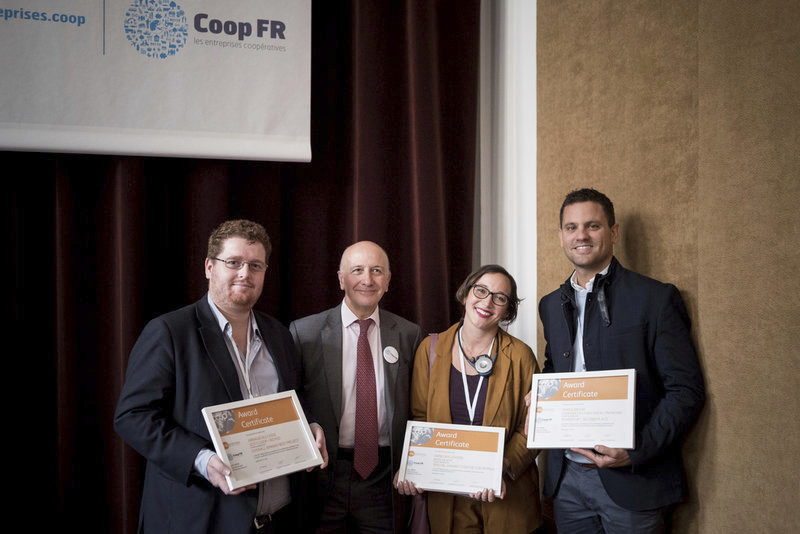 The winner will travel to Paris (travel and accommodation covered) to pitch at the Coop FR celebration of cooperative law’s 70th anniversary and get the chance to expand their own network at the meeting of the European young co-operators (YECN). Besides, the top videos will be disseminated on Cooperatives Europe social media. A trip to Paris – flights and accommodation are on us!